Home renovations can be disruptive and chaotic. But while you’re coping with the confusion and counting the days until the work is done, you can put a positive spin on the situation by using this opportunity to check off a few other long-postponed items on your to-do list or taking a fresh look around to see what new small projects could be added. 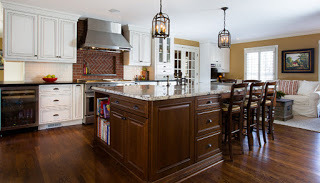 An array of “while you’re here” projects can be accomplished while the contractor or design/build company is on the premises for the primary renovation, resulting in an extra dash of comfort and convenience when the work is done. It’s also more cost-effective to combine small projects with the main remodeling job. Could the painter freshen other rooms with a new color? Could the electrician install a new light fixture? What about an extra outdoor outlet that would make it more convenient for you to plug in holiday lights or a leaf blower? Is there a leaky sink or faucet the plumber could fix? You could also take on a project such as refinishing hardwood floors. Since the house is already dusty and the furniture has been moved, working on the floors won’t make things noticeably more hectic. If you’ve ever considered adding heated floors to the bathroom, act quickly. In the majority of renovations, the work has to be done before tile is installed, so move forward or drop the idea. Have pets? You might want to add a pet door or special ramps or steps to improve accessibility for an older animal. You could also update your home for a contemporary lifestyle by adding a niche where family members can leave backpacks, coats, shoes, or keys as well as recharge electronic devices. Similarly, you could retrofit the kitchen or other room to add pull-out cabinets that make recycling more convenient. If the kitchen isn’t the site of the primary renovation, you can still add accessories such as pullout drawers and trays that will improve organization and efficiency. The laundry area is another site you could tweak with a hanging area for line drying, a pull-down ironing board, cabinets for hampers, or enhanced lighting. You could also make this area serve a dual purpose by fashioning a nook where muddy or dirty shoes can be deposited. While you’re reviewing that old to-do list, it’s also smart to plan for the future. If you think you’ll stay in the house as you get older, you could either install features such as grab-bars or a curb-less shower during the renovation or add blocking behind the walls to provide the support that these features will need if installed later. If you’re not much of a do-it-yourselfer, retain the work crew to install upgrades such as a “smart” thermostat, automatic door locks, or security cameras, all operated remotely via smartphone.